We needed to find an integrator that understood what we were trying to achieve and CCI has been a great fit for us. CCI has been an important part of our team and has helped us raise the bar." For over 100 years, StoneBridge Christian Church has been serving the greater Omaha, Nebraska area with the simple mission of Sharing Christ and Building Believers. From its humble beginnings with eight people in 1908, to the thousands who now gather to worship every weekend, StoneBridge Christian Church continues to grow from campus to many campuses. In 2013, the Stonebridge Leadership team faced two key challenges: a campus regularly reaching its capacity, and a growing population that was too far away to call StoneBridge their church home. Out of those two challenges came a new multi-site vision to plant Stonebridge campuses across the greater Omaha area, allowing them to become a large community of believers with campuses small enough that everyone could feel connected. A bread store was purchased in 2015 to become the Millard campus and renovations began quickly to open their first additional campus in January of 2016. Creating a great experience resembling that of their “Commons” service venue at the main campus was a high priority for the StoneBridge team. In the Accelerated Collaborative Design meeting with the CCI Solutions team in 2015, they detailed their desire that the campus be just as dynamic in its worship space as the main campus, just on a smaller scale. And because the message is generally delivered via video from the main campus, not only did the audio coverage have to be fantastic, but every seat in the room had to be able to connect with the main speaker via video screen, regardless of where they sit. Martin Audio’s new CDD series speakers powered by Bose PowerMatch amplifiers offer audio coverage that is not only extremely even for an odd shaped room, but handles the most intimate worship as well as the loudest of praise with ease. And a mixture of pendant speakers from Tannoy and in-ceiling speakers from Martin Audio carry all of that great sound out to the front door throughout the lobby. Flexibility in mixing while maintaining pristine audio led to the choice of the Midas M32 mixing console, along with Shure QLXD wireless microphones and wired microphones from Sennheiser, Shure, Heil, and Audix. The band mixes their own monitors through the Behringer PM-16 personal mixers, with the wireless recipients using Shure PSM 300s. 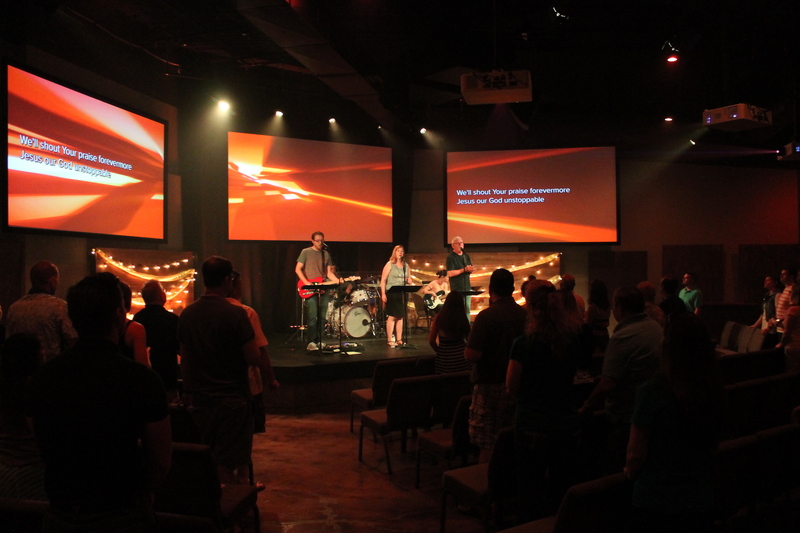 Not to be outdone by an incredible audio system, lighting is just as critical in engaging the congregation in worship. Stage lighting is covered with Chauvet Ovation Fresnel fixtures, with color and special lighting brought by the Chauvet Rogue R1 Wash fixture, all programmed and run from a Jands Vista lighting console. As if that weren’t a great lighting rig in its own right, house lights are the Chroma Q Inspire fixture, which allows the entire room, from the stage to the back row, to be one seamless canvas to create an amazing environment. In an asymmetrical room that was to become a video venue, great care was taken with the design of the screens to ensure that every seat would be able to engage with the message via video. 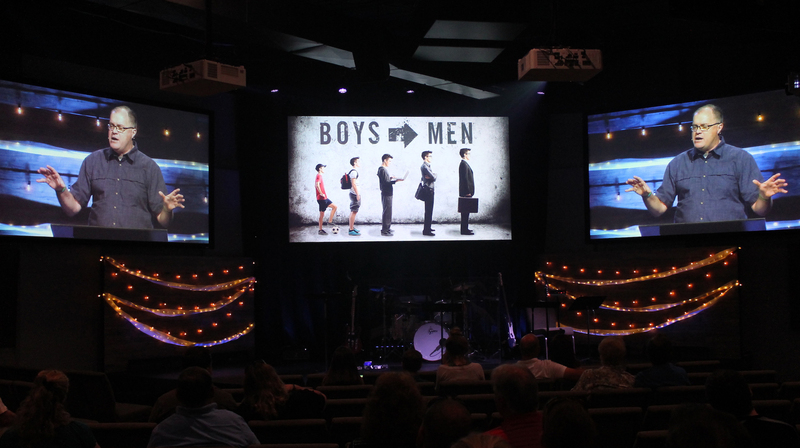 Three screens in a wrap-around, triple-wide configuration around delivers graphics for worship and the video message via Christie LCD projectors. Graphics are handled by ProPresenter with a Datapath x4 controller. Limited camera usage is accomplished with Marshall Electronics POV cameras, and it’s all switched by a FOR-A broadcast switcher. Video playback of the live message broadcast from the main campus is handled by a combination of both Grass Valley T2 and Haivision Makito. The results of the Millard campus launch in January 2016 and the growth since have been so great that Stonebridge Christian Church is already underway to open multi-site campus number two in Freemont, NE, in January of 2017. 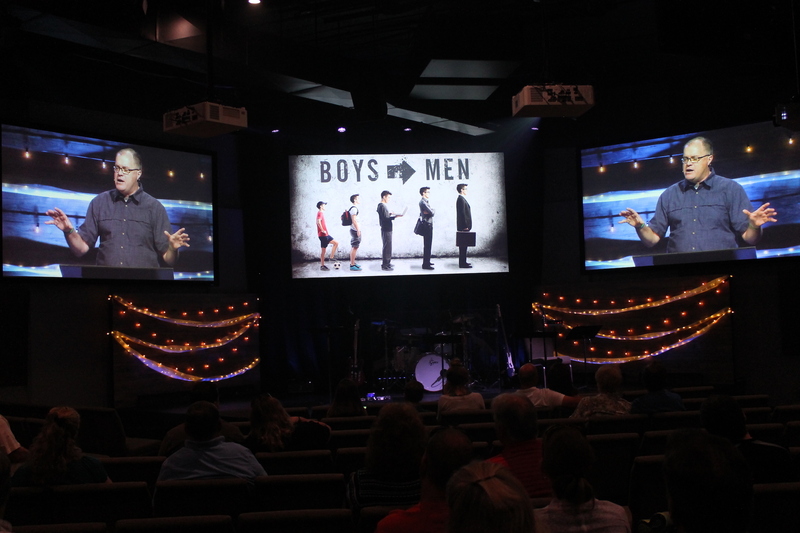 Partnering again with CCI Solutions and deploying much of the same technology there as at the Millard campus, StoneBridge Christian Church is continuing to expand its reach in Sharing Christ and Building Believers to all of the greater Omaha area.